Are you struggling with dirty hot tub water? Do you find your water is never quite as high-quality as you want? Are you troubled by frequent flakes of dirt and other debris in your hot tub? If so, it’s time to clean! In this article, you’ll learn how to tell when it’s time to clean your hot tub filter, as well as other aspects of hot tub ownership you should keep in mind when it comes to treating and sanitizing your water. You’ll also be introduced to several different hot tub filter cleaning solution options as well as other products that can help you make the most of cleaning day. By the time you’ve finished reading this article, you’ll be able to choose the right hot tub filter cleaner for your needs. You’ll also know how to stock up on other items you might want to have handy, such as thermometers, jet cleaners, and more. In no time, you’ll have the cleanest hot tub water you can imagine, and you might learn a little something about cleaning your indoor jetted tub and your pool as well. Now, grab your shopping list and let’s start learning about cleaning hot tub filters and other spa surfaces. You probably already know that cleaning your hot tub filter is very important, but did you know that there are ways to tell when it’s time to keep it clean? You might already be on something of a cleaning schedule, but it can be difficult to remember to keep your filter clean, especially if you don’t keep track of the last time you gave it a good soak or rinse. Follow the tips below and you’ll be able to recognize when it’s time to clean your hot tub filter easily. Do you feel itchy or dry after soaking in your hot tub? Many times, when you need to clean your filter, you’ll notice the water is no longer smooth and comfortable to soak in. If you feel uncomfortable after getting out of your hot tub, it might be time to clean the filter. Has it been more than a month since your last rinsing? If so, check your filter. There might be grime or dirt building up that you can rinse off easily with your garden hose. Has it been more than three months since your last cleaning? If so, remove your filter and soak it in a cleaning solution. Rinse it off well before you install it once again. Has it been more than a year since you changed your filter? If so, it’s probably time for a new one. Most filters can’t be used for more than a year without needing to be replaced. They usually start to get too dirty after this amount of time or may start to weaken from overuse. Although cleanliness and water sanitization are some of the most important aspects of hot tub maintenance and upkeep, there are a few other things you should keep in mind in order to have a safe and pleasant hot tub experience at all times. Remember these tips and you should have no trouble improving the quality of your overall hot tub water so that you, your family, and your friends can have a great time with plenty of excellent soaks in your future. pH – Treating your water with regular pH treatments can help cut back on nitrates that can build up in water over time. This can also make the water much more comfortable for you to use, and can even cut back on potential allergic reactions you might experience from frequent exposure to unbalanced water. Test your water’s pH often with test strips from your pool supply store. Alkalinity – Water of a certain pH level is too alkaline and can cause damage to your plumbing as well as to your body, depending on how sensitive you are. Treat your water for alkalinity regularly if this is the case. Water hardness – Hardness is when water has too much calcium present. When this happens, your pipes can develop build-up easily, and you can experience discomfort when using your hot tub. Treating water hardness can be difficult, but you should be able to get it under control with the right chemicals. Bacteria – Last but not least, you should always be aware of the potential for bacteria in your hot tub water. The temperature of hot tub water has a lot to do with bacteria, so monitor that temperature regularly with a hot tub thermometer. Be sure to treat with chlorine to keep your water as free from bacteria as possible. Bring home this large bottle of Oh Yuk Healthy Hot Tub Cleaner for one of the best and most affordable methods of hot tub cleaning available on the market today. This cleaner is designed for use in your whole hot tub, but it is not made for running through the pipes or jets. However, you can use it on every surface of your tub and even use it on some types of filters, depending on what you have. Be sure to read the directions on the bottle to be certain you can use it on the type of filter you have. Easy to use on just about any surface of your hot tub. Made to help reduce the chance of gunk in your spa and break up any pre-existing problems. Features a low-foaming formula that won’t clog up your jets or pipes. This product is only available as a large bottle, which means you won’t be able to give it a test run before committing to it. This is a harsher chemical product than many of the others listed here. This product cannot be used on certain types of hot tub surfaces, such as stone. 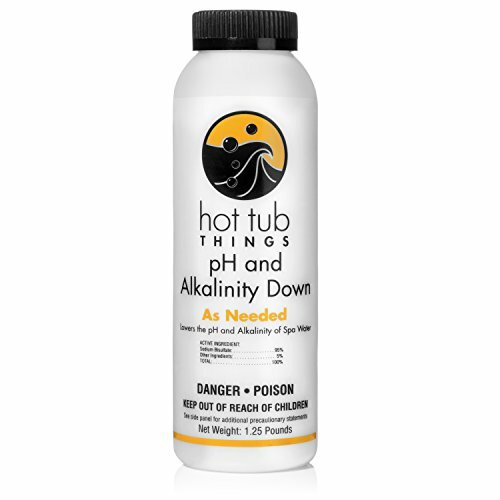 If you are looking for a great way to balance the water quality in your hot tub, look no further than this Hot Tub Things pH and Alkalinity Down powder. This powder can be used to treat your hot tub water and help cut back on both alkalinity and pH to make the water safer than ever before. This is an excellent product for anyone who has skin allergies or sensitivities to water that might not be properly treated. 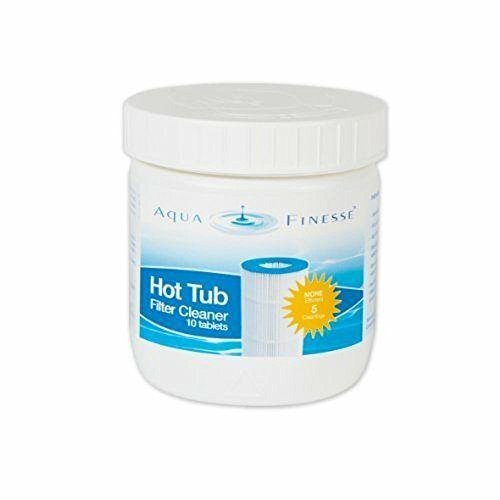 Best of all, it gets the job done without harsh chemicals, so you won’t have to worry about aggravating your allergies further by including this powder in your regular hot tub water treatment. This bottle contains enough powder for several treatments in your hot tub. The chemicals used in this powder are pure and not laced with any additives. This is a well-known product with good customer service to back up its quality. This product cannot be used with swimming pools and is only designed for use in hot tubs. You might not be able to use this product with some types of filters, including sand filters. Very alkaline water might need more of this treatment, which in turn can make this an expensive solution. 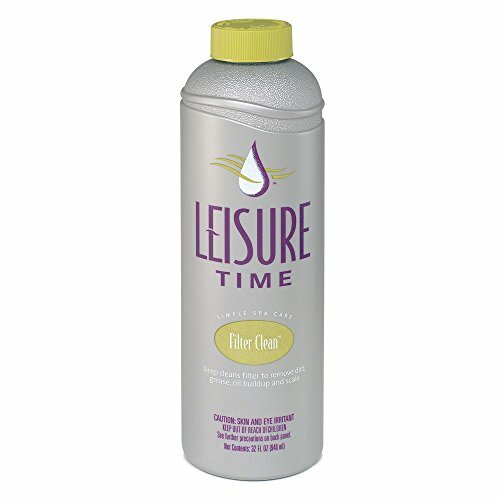 Choose this Leisure Time O Filter Clean ﻿﻿Cartridge Cleaner for an excellent soaking solution for any type of hot tub filter you might have. This product is great for use on polyester and paper filters, and it can be used on ceramic and sand filters as well by following the directions listed on the bottle. It’s designed with a long-lasting formula that can break up tough build-up and remove oil and grease from your filter cartridge as well. This is a product that has been on the market for a long time and continues to surprise and delight hot tub owners every day. This product is available in a one or two-pack or as an affordable twelve-pack option. This is a simple product without a lot of harsh chemicals that won’t damage or weaken your filter cartridges with frequent use. This bottle includes enough for two or three filter cleanings. This is a foaming product that may leave behind a lot of residues without a proper rinse and dry after the soak. This is an overnight soak that might take longer to clean your filter than some of the other products listed here. This product is more expensive than many of the others listed here. This large bottle of Natural Hot Tub Company All Natural Filter Soak solution is a great option for anyone looking for an affordable bottle of cleaning solution that can be used again and again for regular filter cleanings. This solution is designed for use with pleated filters, including both paper and polyester. Although it can’t be used with some other types of filters available today, it is perfect for many of the most popular filters on the market. Pick up a bottle and see for yourself what makes this a popular choice for hot tub owners looking for a great-smelling and environmentally-friendly way to keep their filters clean. This solution features a citrus scent that helps to mask the chemical smell associated with many other similar products. This is an environmentally-safe product that isn’t toxic and can be washed into the yard without causing pollution. Each bottle includes enough solution for about ten filter cleanings. If your filter is very grimy or has build-up, you might need to soak it more than once with this product. This is an overnight soak, so you’ll need to leave it longer than you would for a different filter cleaner. Although this product is non-foaming, it will leave behind residue without a proper rinsing afterward. Choose the Oh Yuk Jetted Tub System Cleaner when you want to remove dirt, debris, and bacteria from your jetted whirlpool bathtub. This product is made for use with indoor spa tubs and isn’t the same formula as you might want for an outdoor hot tub. However, if you’re looking for something you can use inside without fear of fumes from harsh chemicals or potential damage to your indoor plumbing, this is an excellent option for you. This product has been around for a while and continues to be a top choice for anyone with a jetted indoor spa tub. Use it regularly for quick, 15-minute cleans and you’ll soon have fresher, cleaner bath water than you can ever imagine. This solution is safe for use with your septic system and won’t cause damage to the pipes or to the surrounding environment. Each bottle of this product includes enough solution for up to four cleanings. This solution is made for use in the jets and pipes of your tub as well as the surface. If your jetted tub has build-up, it might take a few cleanings to break up all the debris inside your jets. You may need to let this solution soak longer than the directions given, especially for very dirty tubs. This is a foaming product, so you will need to be sure to thoroughly rinse out your tub before use following a cleaning. 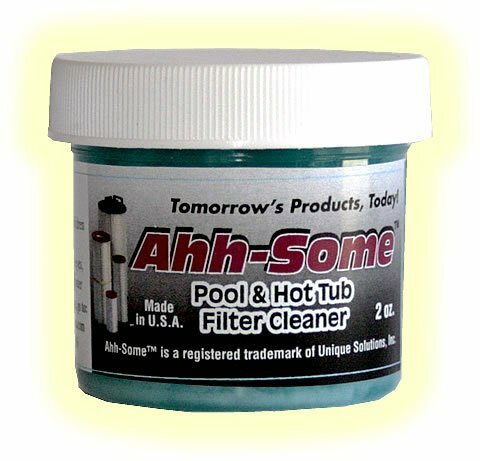 Choose the Ahh-Some Pool & Hot Tub Filter Cleaner when you want a product you can use to clean your filter cartridge easily without having to resort to very harsh chemicals. This simple cleanser can be mixed with water in a large bucket to create the perfect soaking solution for your filter cartridge. It can be used on any type of filter media, from polyester to paper to ceramic and anything else you can imagine. Best of all, there is enough included in this package of powder cleanser to clean your hot tub filter two or three times before you’ll need to replace it. This cleaning soak only takes 15 minutes to complete, which is much faster than many of the other solutions available. This cleanser is designed to keep your filter cartridge from getting damaged too much with frequent uses. This cleanser can even be used with sand filters if you follow the included directions. For only two or three uses, this may be a more expensive product than some of the others listed here. This cleaner works best when used in conjunction with a full spa cleaner. The cleaner has been known to have a strong chemical smell that might be too strong for some users. 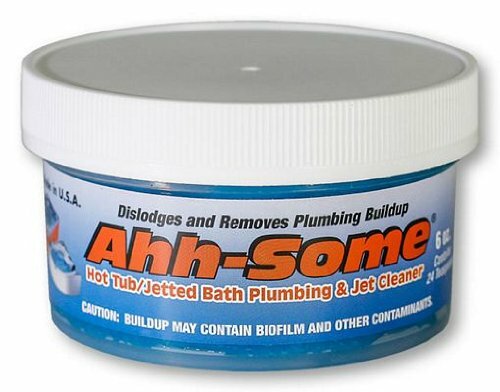 The Ahh-Some Hot Tub/Jetted Bath Plumbing & Jet Cleaner is a great solution for anyone looking to clean their hot tub and all its inner workings with a high-quality liquid solution. This product can be used in a hot tub or in a jetted bathtub, but it is not designed for pool use. However, when you use it in your spa, you’ll be surprised at just how clean your whole system can get with just one cleaning. Use it in conjunction with a filter cartridge cleaner for regular spa cleanings a few times a year and you’ll have the most sparkling clear water you can imagine. Can be flushed or dumped on the lawn without fear of contaminating soil, plants, or groundwater. Works on jets as well as pipes and plumbing for a thorough cleaning every time. This is an expensive product that might be over budget for some hot tub owners. This solution might not be able to completely flush out your hot tub lines if you have hard water build-up. The chemical smell from this product is too strong for some people to stand. Pick up a pack of these Aqua ﻿﻿Finesse ﻿﻿Filter Cleaner tablets to make spa cleaning day much easier than ever before! These tablets are designed specifically for use in your hot tub, which means they aren’t the same type of tablet cleaner you need for a swimming pool. However, if you’re looking for something affordable to help you keep the water in your hot tub clean and sparkling, this is a great option for you. These tables don’t include any harsh chemicals, so you don’t have to worry about damaging your existing filter cartridge or other spa parts. Try it today and see for yourself how great this product can be. This affordable package of tablets comes with plenty of uses to keep your water clean for months. Each tablet is individually wrapped, so you can just open them and drop them in without having to touch them. These tablets can be used with any type of spa filter. In some spas, you might need to break the tablets in half before putting them in the water in order for them to dissolve well. These tablets will need to be used in conjunction with other filter cleaners for maximum effectiveness. Some very dirty filter cartridges will need to be soaked more than once with these tablets. 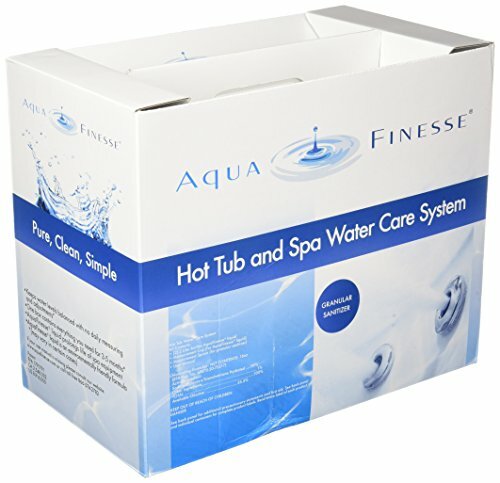 Pick up a box of this AquaFinesse Hot Tub Water Care Kit and you’ll have everything you need to get started cleaning and sanitizing your hot tub water right away. This kit comes with a cleaning solution and sanitizer as well as a measuring cup and tips for how to use it more effectively. It only takes a minute once a week to perform this water treatment on your spa water, but you’ll notice a huge difference in cleanliness right away. Take note, however, that this product cannot be used with a pool and is only formulated for spa use. This product doesn’t leave behind a strong chemical odor, even just a few minutes after use. You won’t be able to tell that there are any chemicals in your water to damage your skin when you use this product. This is a very affordable water care kit that’s sure to come in under any budget. This water care kit may aggravate allergies and very sensitive skin. This product may not be able to treat water that is very high in alkalinity. The product might not work on water that is very hard. Do you find it difficult to measure the quality of your water on a regular basis? Do you think it’s hard to figure out the treatments you need to keep your pH balanced and your water crystal clear and clean? With the NATAMO﻿﻿﻿﻿ Handheld Digital Pool Water Quality Tester, you’ll be able to keep track of all of these important aspects of your hot tub at all times with almost no margin of error. 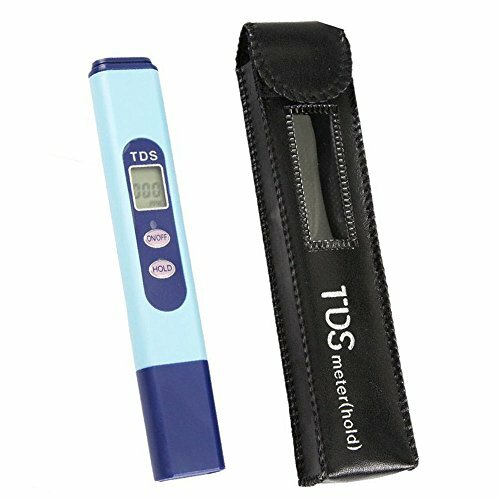 You’ll have no trouble paying close attention to your water quality with the help of this convenient tester. Very easy to use and read with just a few buttons and a large digital display screen. Durable design is able to resist a lot of potential damage and frequent exposure to water. Able to be used right out of the box without needing any complicated setup or battery installation. May show an error message at first after installation, which will require a call to customer service to take care of. May not be able to read the chemical makeup of a very large pool or a spa with a lot of treatments in the water. May not work well with very hard water that has a lot of calcium buildup. Are you looking for a good way to absorb unwanted chemicals in your hot tub water? Do you find it difficult to remove oils, lotions, and scum from your spa without having to empty the whole tub and refill it every time? If so, you need the Oilinator ﻿﻿Pool & Spa Saver in your hot tub right away. This product can be easily used in either your spa or your pool, and it’s not simply filled with foam that will get heavy and soggy too quickly to do anything. Use it along with other cleaning products for fresh, sparkling water at all times. This product is covered in a durable plastic fabric that can withstand exposure to chemicals like chlorine in your water. The product does not contain any chemicals itself. The product attaches to the filter basket with a twist tie only, which may be very easily broken over time. 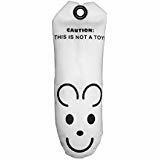 Because of the cute design of this product, some children might mistake it for a toy, although it is not safe to play with. The product is not washable and cannot be reused after one time. 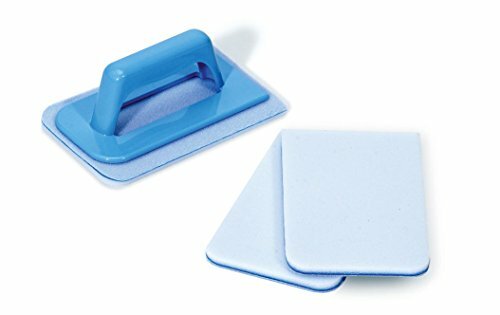 With these Pool Equipment & Parts HydroTools, you’ll be able to clean any part of your pool or spa easily with the help of these simple cleansing pads. One set of these pads includes two interchangeable, replaceable pads as well as a durable plastic handle that can make it easy for you to hold on while you clean your hot tub. Be sure to pick up a pack or two of these every time cleaning day rolls around, and you’ll be better able to successfully clean your pool or your spa without having to exert too much effort to do so. Regular cleanings have never been so simple! The durable plastic handle can hold up to a lot of use over time. Easy to use in either a pool or a spa, and can be used interchangeably between both. Able to be used along with many popular pool and spa cleaners. May disintegrate with frequent use along with very harsh cleaning chemicals such as bleach. May absorb a lot of water and become less effective for cleaning when the pool or tub is still wet. Pads are not available in bulk and may be hard to find replacement parts for. Use this Pool ﻿﻿﻿Equipment ﻿﻿﻿& Parts Floating Water Thermometer to help you keep track of the overall cleanliness and healthiness of your spa water. This product can be easily used in either a pool or a spa, and it works well in conjunction with other items to help you monitor your water at all times. Since many types of filters and cleaners only work with water that is at a certain temperature, it is crucial to keep an eye on how hot or cold your water gets. This can also be a good indicator of whether or not your heater is working properly. This easy to use thermometer reads your water’s temperature very accurately. The thermometer is very small and can be tucked out of the way for regular use without it being a problem. The thermometer floats and is completely water-safe for extended and frequent use. This thermometer has a small display that might be difficult for some users to see. The thermometer is not completely encased in plastic, which might lead to breaking and damage. 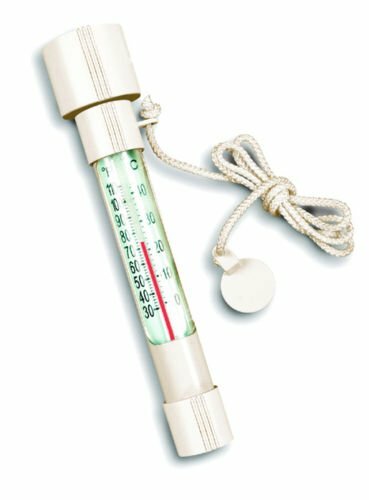 The included tether with this thermometer has been known to break with frequent use in the water. Pick up a package of Sparoma Citrus Spa Treatment to improve the quality and smell of your hot tub water every time you run your spa. Each individual package comes with three capsules included, so you can enjoy an aromatherapy soak in your hot tub whenever the mood strikes you. Best of all, this is more than just a capsule to make your spa smell good. It also can help improve the overall sanitation of your spa water, especially with frequent uses. Cut back on the amount of cleaning you need to do for your filter when you make the most of this treatment on a regular basis. Smells great and can be used for aromatherapy as well as cleanliness. Comes with more than one use, so it can be cost-effective. Available in many different smells to help you choose the right one for your needs. This is a much less affordable product overall than many other cleaners on the market today. This product must be used along with other filter cleaners for prime effectiveness. This product might not be able to be used with certain types of filters, such as sand filters. Now that you know a little bit more about hot tub filter cleaning solutions and other hot tub cleaning products available, you should be able to make the right call and pick the ones that are best for you. Whether you are looking for something to help improve the overall quality of your water, monitor your water quality, clean your jets and plumbing or just soak your filter cartridges, you can find the perfect products on this list to help you make the most of your hot tub ownership. Remember that it won’t be too hard to clean your hot tub from top to bottom, and that regular quick cleanings are even easier to take care of. When you learn how to clean your hot tub and filter cartridges on your own, you’ll be able to save a lot of money without having to call a technician to do this job for you. Best of all, taking care of DIY cleaning is a great way to be sure your hot tub is always as clean and spotless as you want it to be. Grab the cleaners you need to get started, and get ready to start scrubbing!